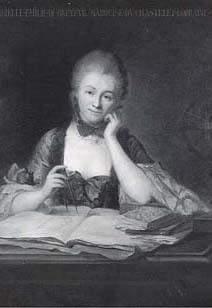 As we set our watches, we might send carefully-calculated birthday greetings to Gabrielle-Émilie Le Tonnelier de Breteuil, Marquise du Châtelet, the French mathematician and physicist who is probably (if unfairly) better known as Voltaire’s mistress; she was born on this date in 1706. Fascinated by the work of Newton and Leibniz, she dressed as a man to frequent the cafes where the scientific discussions of the time were held. Her major work was a translation of Newton’s Principia, for which Voltaire wrote the preface; it was published a decade after her death, and was for many years the only translation of the Principia into French. Judge me for my own merits, or lack of them, but do not look upon me as a mere appendage to this great general or that great scholar, this star that shines at the court of France or that famed author. I am in my own right a whole person, responsible to myself alone for all that I am, all that I say, all that I do. it may be that there are metaphysicians and philosophers whose learning is greater than mine, although I have not met them. Yet, they are but frail humans, too, and have their faults; so, when I add the sum total of my graces, I confess I am inferior to no one. Special Holiday bonus: the story behind those massive bows that bedeck cars given as Holiday presents. 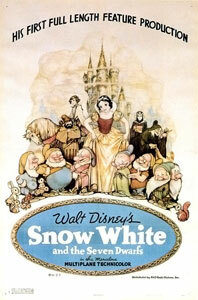 As we fold with care, we might recall that it was on this date in 1937 that Walt Disney released the first full-length animated feature film produced in the U.S. (and the first produced anywhere in full color), Snow White and the Seven Dwarfs. 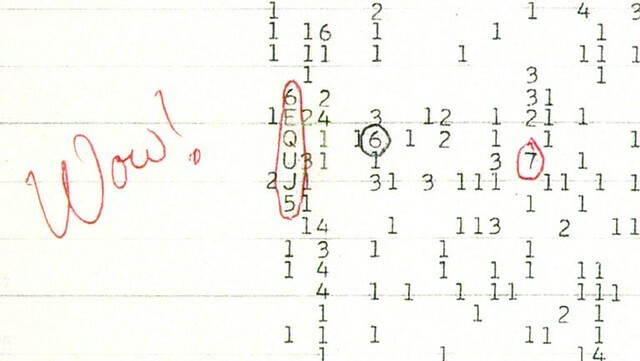 In the world of mathematical tiling, news doesn’t come bigger than this. In the world of bathroom tiling – I bet they’re interested too. 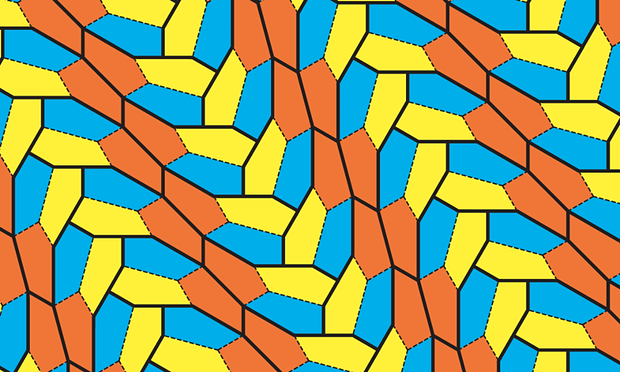 If you can cover a flat surface using only identical copies of the same shape leaving neither gaps nor overlaps, then that shape is said to “tile the plane.” Every triangle can tile the plane. Every four-sided shape can also tile the plane. Things get interesting with pentagons. The regular pentagon cannot tile the plane. (A regular pentagon has equal side lengths and equal angles between sides, like, say, a cross section of okra, or, erm, the Pentagon). But some non-regular pentagons can. 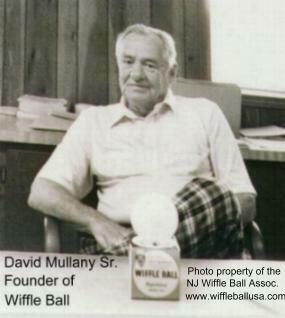 As we grab the grout, we might recall that it was on this date in 1953, after a year of experimentation, that marine engineer and retired semi-pro baseball player David Mullany, Sr. invented the Wiffleball. (He patented it early the following year.) Watching his 13-year-old son play with a broomstick and a plastic golf ball ball in the confines of their backyard, Mullany worried that the effort to throw a curve would damage his young arm. So he fabricated a full- (baseball-)sized ball from the plastic used in perfume packaging, with oblong holes on one side… a ball that would naturally curve. The balls had the added advantage, given their light weight, that they’d not break windows. David Jr. came up with the name: he was fond of saying that he had “whiffed” the batters that he struck out with his curves. The “h” was dropped, the name trademarked, and (after Woolworth’s adopted the item) a generation of young ballplayers– and their parents– converted. 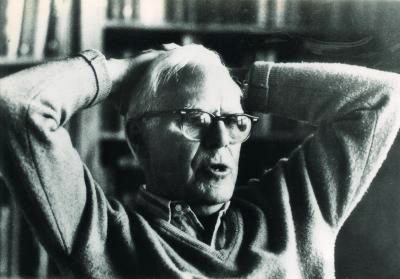 As we phone home, we might spare a thought for Martin Gardner; he died on this date in 2010. Though not an academic, nor ever a formal student of math or science, he wrote widely and prolifically on both subjects in such popular books as The Ambidextrous Universe and The Relativity Explosion and as the “Mathematical Games” columnist for Scientific American. Indeed, his elegant– and understandable– puzzles delighted professional and amateur readers alike, and helped inspire a generation of young mathematicians. Gardner’s interests were wide; in addition to the math and science that were his power alley, he studied and wrote on topics that included magic, philosophy, religion, and literature (c.f., especially his work on Lewis Carroll– including the delightful Annotated Alice— and on G.K. Chesterton). And he was a fierce debunker of pseudoscience: a founding member of CSICOP, and contributor of a monthly column (“Notes of a Fringe Watcher,” from 1983 to 2002) in Skeptical Inquirer, that organization’s monthly magazine. Math doesn’t explain why math works. And it never, ever will. In the late 1800s, mathematicians were doing some soul-searching. 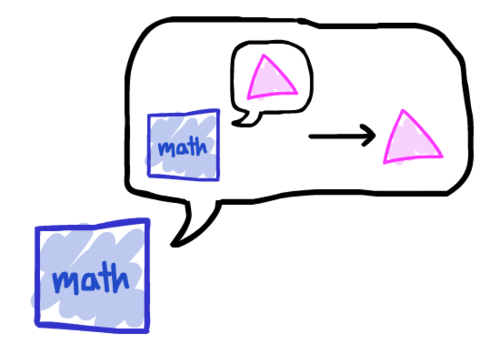 They’d been solving problems and proving theorems since forever, but none of them really knew why these methods worked. And this was getting kind of awkward. See, math is just a bunch of rules for turning true statements into other true statements. Assume some stuff, follow the rules, prove other stuff. And the crazy thing is: the stuff you prove is always, always true. Or at least, it’s never once been wrong. Read more of this answer, and others– “complicated stuff explained at a 12 year-old level”– at Romy Asks. 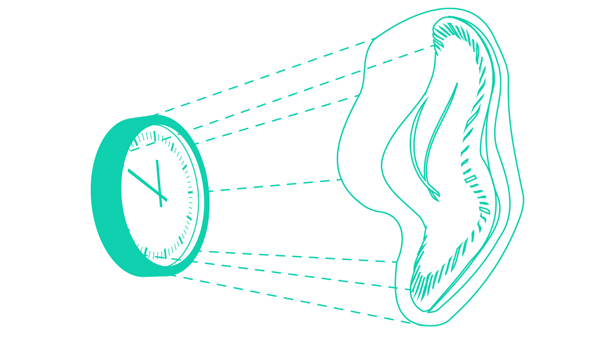 From Zogg from Betelgeuse , “Mathematics: Measuring x Laziness²,” the latest entry in the Earthlings 101 series– a beginner’s guide for alien visitors. 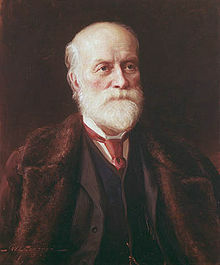 As we dazzle ’em with differentials, we might spare a thought for Sir Sandford Fleming; he died on this date in 1915. 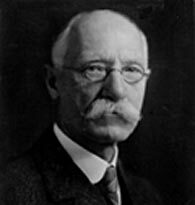 A Scottish engineer who emigrated to Canada, Fleming designed much of the Intercolonial Railway and the Canadian Pacific Railway; was a founding member of the Royal Society of Canada; founded the Royal Canadian Institute; and designed the first Canadian postage stamp (the Threepenny Beaver, issued in 1851), But he is best remembered as the man who divided the world into time zones– the inventor of Worldwide Standard Time. 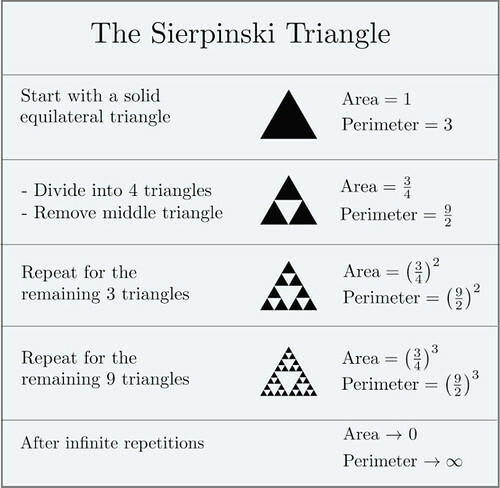 In 1915, Polish mathematician Wacław Sierpiński described what’s now known as “the Sierpinski triangle” in 1915. He was explicating the properties of a pattern that had appeared in the 13th-century Cosmati mosaics in the cathedral of Anagni,Italy, and other places of central Italy, in carpets in many places (e.g., in the nave of the Roman Basilica of Santa Maria in Cosmedin), and in isolated triangles positioned in the rotae of several churches and Basiliche. See how this fabulous fractal maps onto the rather better-known Pascal’s Triangle. As we ponder patterns, we might send efficient birthday greetings to Lillian Evelyn Moller Gilbreth; she was born on this date in 1878. One of the first working female engineers holding a Ph.D., she was arguably the first true industrial/organizational psychologist. With her husband Frank Gilbreth. she was one of the first “efficiency experts” helping establish the fields of motion study and human factors. 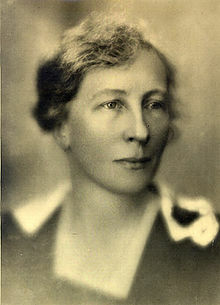 She is perhaps best remembered as the subject of Cheaper by the Dozen and Belles on Their Toes (charming books written by their children Ernestine and Frank Jr.) recounting the couple’s family life with their twelve children, and their application of time and motion study to the organization and daily routines of such a large family.